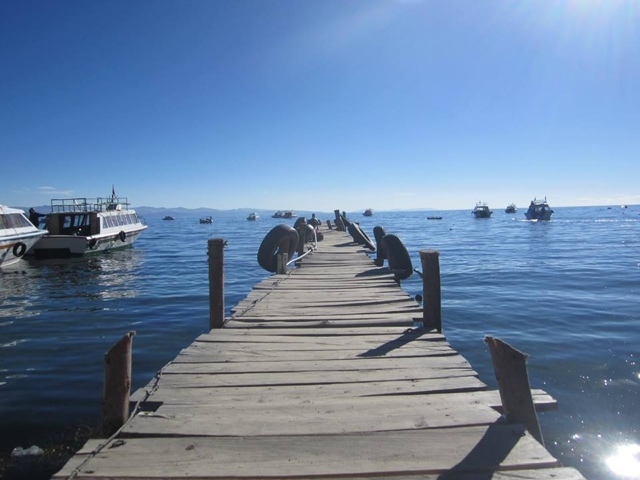 It was a fairly pleasant 3 and a half hour bus ride mainly along the lake from Puno to Copacabana. 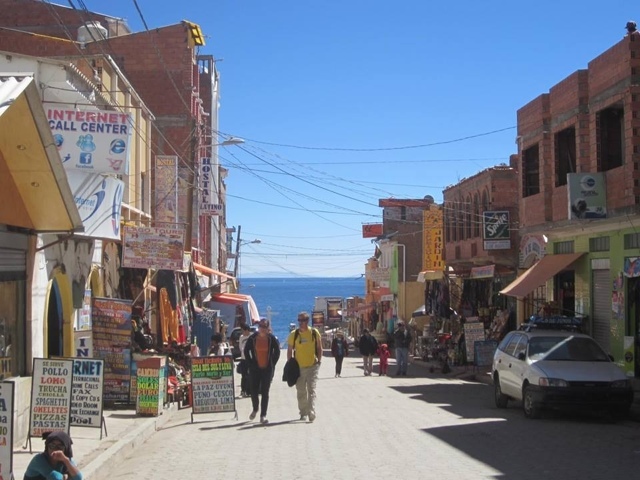 Upon arrival, it was very obvious that I was going to like this town a lot more than Puno. It was situated right on the lake and had that real small town, friendly feel to it. 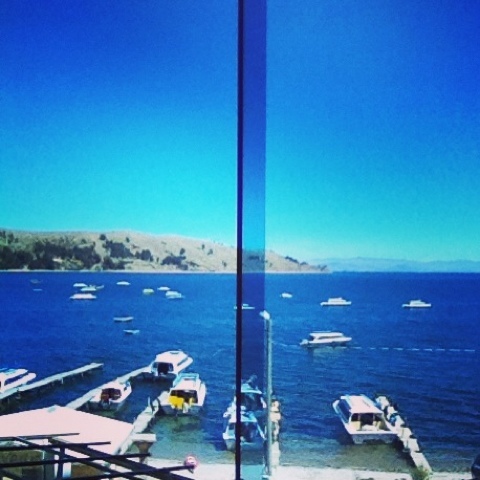 As it is situated at high altitude, the sky is extremely blue and clear and the lake reflects the lovely blue colour. Some friends of ours had stayed in Copacabana the night before and had recommend a hotel, they said it was good but still in the process of being built. When we found it there seemed to be no reception, instead it appeared that one of the tradesmen was going to give us a room. “How much for one night?” We asked. “60 Bolivianos each” he said. “60! ?” I gasped, still not used to the new currency (really it was only $8 AUD). “this is a Hotel, not a Hostel Señorita” he replied. We decided to take a took at the rooms. “Do you have wifi?”, “no it’s nuevo! (New)”,”is there hot water?” “Yes is nuevo!”, ” Can we please have some towels and toilet paper?” “Oh yes, sorry it’s nuevo!”. We decided to stay at this crazy, insanely cold ‘nuevo!’ hotel that was still in the process of being built. Our room was pretty nice with a bathroom, cable tv (something we hasn’t seen in over month) and most importantly a lovely view of the lake. There isn’t a whole lot of things to do in Copacabana, considering its such a tiny town. You can take day trips to some of the islands, but again we opted not to do that. 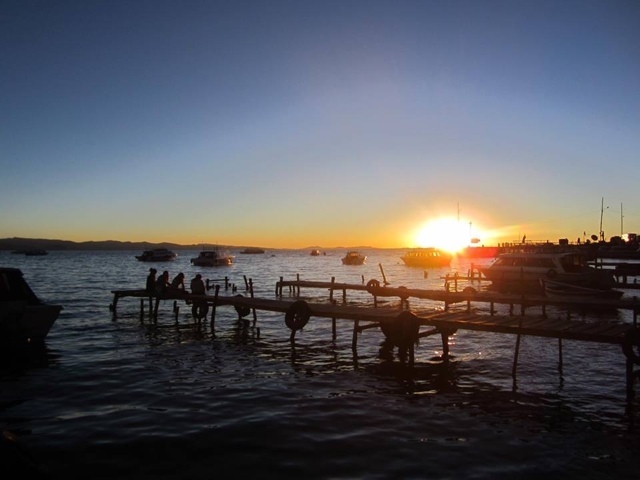 Instead we spent two blissful days eating the best nachos ever, eating the famous troucha (trout) fished from the lake, drinking coffees and fresh juices and sitting on the jetty soaking up the sun and watching the beautiful sunsets over the the lake. Basically we did a whole lot of nothing. Time to relax! 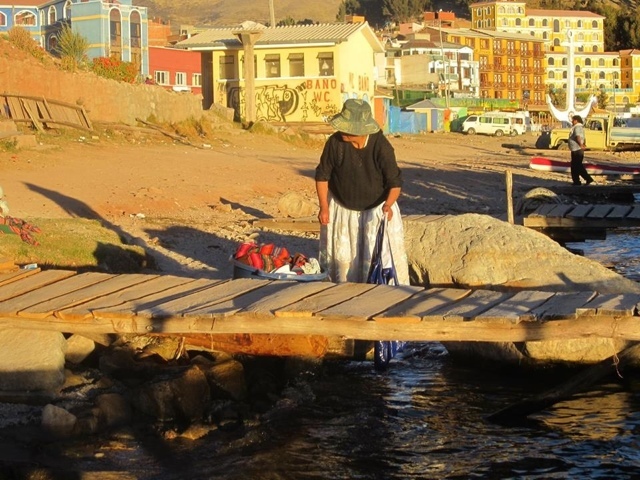 During one of our blissful afrernoons soaking up the sun on the jetty I noticed a Bolivian lady in tradition dress with three children, one a tiny baby, and a big bucket of clothes. She perched the baby on a bundle of blankets by the lake and let the other boys run around while she hauled her giant bucket of clothes down to the lake and began to wash all of her clothes. After she had finished doing that, she got out her shampoo, flipped her head over and began to wash her hair in lake. Bearing in mind that it was currently about 8 degrees, this poor lady must have been freezing!! It made me feel so sad to think that people still live like this in this day and age, with no running water and no electricity in their houses. These people work hard yet they seems so carefree and happy compared to a lot of people in the western world who have a lot more. It made me feel suddenly very grateful for the easy life I live and a little ungrateful for the times I’ve complained about the showers not being hot in Bolivia or the discusting toilets and the fact that you are responsible for your own toilet paper no matter where you go. Seeing this lady reminded me to never take things from granted and to make the most of the opportunities my life has given me.